The Boston Harbor Association alleges that Russia Wharf’s owners, Boston Properties Inc., is going back on its promise to locate free public performance space on the first floor in favor of putting a restaurant there instead, said Vivien Li, executive director of the association. According to the BHA, Boston Properties was granted the right to build a taller building in exchange for public space on the ground floor. The Boston Harbor Association wrote a letter to the state Department of Environmental Protection in April commenting on changes Boston Properties requested. The changes have to be approved by DEP since the agency grant licenses for waterways development under Chapter 91. Li has been in discussions with Boston Properties for the past six months about the changes. In her letter, Li wrote that Boston Properties asked to reduce the size of a ground floor “Town Square” by 200 square feet to 6,100 square feet, has moved a “Multi-Media Presentation Area” of 3,800 square feet from the first to second floor. Li said the areas will not be visible from the street and therefore relatively hidden from the public. Also, Boston Properties has added a 2,800-square-foot outdoor terrace as part of the Multi-Media Presentation Area which will make year-round lectures and screenings difficult. Li said she only wants Boston Properties to hold up its end of the bargain. She said the developer received approved to exceed height regulations and built between 100 feet and 150 taller in exchange for providing the public spaces. Boston Properties did not respond to requests for comment. “We’re just saying, ‘Do what you agreed to do,’ ” said Li. “What should have been a free, robust public space is now being chopped up,” Li added. There was no mention of the flap during the “topping off” ceremony held on Tuesday. The ceremony commemorates when the last beam of structural steel is set in place. Russia Wharf is a the 854,000-square-foot project on the edge of Boston’s Financial District, the Rose Kennedy Greenway and the Fort Point Channel. The ceremony was attended by Mayor Thomas M. Menino and Boston Properties Inc. The $500 million, 31-story mixed-use project includes 60,000 square feet for retail space as well as 5,000 square feet for artist-work space and 65 new units of housing, according to a press release from Menino’s office. 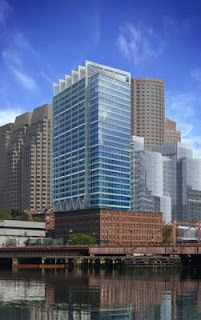 Russia Wharf is preleased to Wellington Management and is one of the few office buildings under development in Boston. Wellington Management Co. LLP is leasing approximately 450,000 of the 750,000 square feet of office space in the building and will bring 1,500 employees to the neighborhood. “This project will be a tremendous addition to our downtown waterfront, bringing new residential, office, retail and artist work space to the area,” Menino said in a statement. “Even in this economic climate, Boston still has projects that are moving forward. Construction began early last year. CBT Architects was hired to oversaw the design for the historic rehabilitation of the 19th century buildings. The project is expected to earn LEED (Leadership in Energy and Environmental Design) Gold certification and will be complete in 2011.